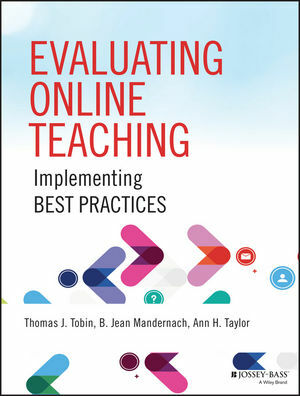 Evaluating Online Teaching is the first comprehensive book to outline strategies for effectively measuring the quality of online teaching, providing the tools and guidance that faculty members and administrators need. The authors address challenges that colleges and universities face in creating effective online teacher evaluations, including organizational structure, institutional governance, faculty and administrator attitudes, and possible budget constraints. Through the integration of case studies and theory, the text provides practical solutions geared to address challenges and foster effective, efficient evaluations of online teaching. Readers gain access to rubrics, forms, and worksheets that they can customize to fit the needs of their unique institutions. The book concludes with an examination of strategies for fostering change across campus, as well as structures for creating a climate of assessment that includes online teaching as a component. Evaluating Online Teaching helps institutions rethink the evaluation process for online teaching, with the end goal of improving teaching and learning, student success, and institutional results. THOMAS J. TOBIN is coordinator of learning technologies at the Center for Teaching and Learning at Northeastern Illinois University and serves on the editorial boards of the Online Journal of Distance Learning Administration and the Journal of Interactive Online Learning. B. JEAN MANDERNACH is director of the Center for Innovation in Research and Teaching and research professor at Grand Canyon University. ANN H. TAYLOR is director of the John A. Dutton e-Education Institute at Penn State University and serves on the editorial board of eLearn Magazine.